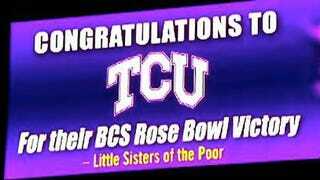 The Little Sisters of the Poor apparently have enough money to put up billboards around Columbus, congratulating TCU on their Rose Bowl win. Take that, drivers of Central Ohio! Immaculately bowtied Ohio State president Gordon Gee, you'll recall, denigrated TCU's schedule a few months back (It still stands — TCU failed to play a ranked team on the road this year TCU's strength of schedule according to the Sagarin Rankings was 60th. But for the record, Ohio State's was not much better, at 50th.). But then Ohio State had to go and finish second in the Big Ten, while the Horned Frogs rolled into the Rose Bowl and beat the best the Big Ten had to offer. A lovely spot of revenge, but what good is it if you can't repeatedly and ostentatiously shove it in their faces? Twenty billboards, from the "Little Sisters of the Poor" congratulating TCU on their win, popped up in and around Columbus today. Gordon Gee was unavailable for comment.